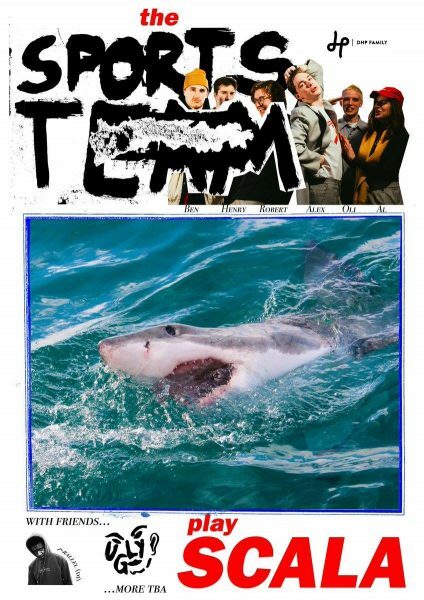 Images courtesy of Sports Team/Nice Swan Records/Holm Front Records. Description: indie sextet Sports Team, posing. So, looking back on your time at Cambridge, do you have any advice for the new cohort of Oxford Freshers? Rob: (Rob Knaggs, guitar) Just crack on with the work, get in the library, and secure your spot in that library. So when it comes to exam time you’re set up, ready to go! Al: (Al Greenwood, drums) Make friends with the reading list. Alex: (Alex Rice, Singer) Save yourself from yourself. Start a band as soon as possible. Haha! 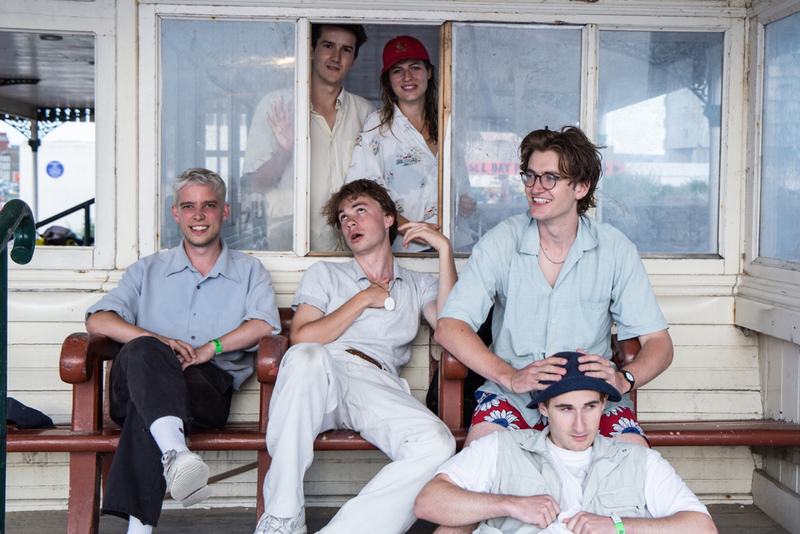 so how’s the tour with the Magic Gang gone? Oli: (Oli Dewdner, bass): It’s been great. We’ve said it a lot, but they’re essentially our favourite band. Alex: (Alex Rice, singer): We invited ourselves! We invited them! Oli: We went round with biros to every city, just put our names at the bottom, and no one really checked! And you’re touring with Hinds in November. Headlining the Scala @ King’s Cross. Having a mad one. The poster for their show at Scala, London. The first time I saw you was at Margate in August. The second time I saw you was a couple of weeks ago at SCALA. For as long as I’ve known you as a band, you’ve been promoting the show. What was it finally like doing it? Al: We’re still tired from that, actually. Henry: (guitar) Best night of my life! Alex: We always talk about gigs: We’d take the afternoon off work and go and make a day of it, go to the pub. But literally that did feel like a proper, distinctive performance: we were there the whole day setting up, the sharks… Everywhere, every pub was just packed. It was havoc! Where did you get the decorations from? You had, as you say, the sharks, the flowers. Al: Tin foil and bamboo. And a lot of love! Did you have to pass any health and safety checks? Henry: Yeah we did. There was a real debacle where we thought we wouldn’t be able to bring the shark into the venue. We spent, honestly, about two days making it in at the house. Ben had constructed this bamboo structure. We’d spent so many hours making it. And when you say, “oh no, it’s a fire hazard”, what do we do? We go out to get some fireproof spray. Al: Yeah, we never actually got that. Rob: We smuggled it in. Alex: I remember we were like “We haven’t sprayed it! The spray hasn’t arrived! How do you spray it! How does the spray come! We couldn’t possibly spray it.! There was also an exciting moment where you, Alex, threw the shark, while standing on the speakers. Al: Don’t bring it up, mate, it’s a sore point. Ben’s child. Henry: I had a dream the night before that we were going to throw it out together in the end in a kind of romantic way. Then I saw a minute through ‘Kutcher’ Ricey’s eyes light up, and him about to throw it, and I looked across at Ben, and I thought at that moment, when the baby shark was getting torn limb from limb, that Ben Mack’s stage cool was finally about to be broken. And that he’d let out some sort of yell. But there was nothing. How was the night afterwards? Alex: Went on for about two and half days. We had the after party in the Lexington. It kicked off, went on for quite a while. Then we had an Airbnb in Brook lane, where we all came back after that. Then I ended up at the Britannia International Hotel somewhere in Docklands. It went on and on and on. We felt giddy, amazing, such a high when we came off that stage. It was the best night of our lives, genuinely. That show got in The Guardian as well. How was that, to be in The Guardian? Writing Songs. Playing Songs. And what is ‘Indie’ anyway? 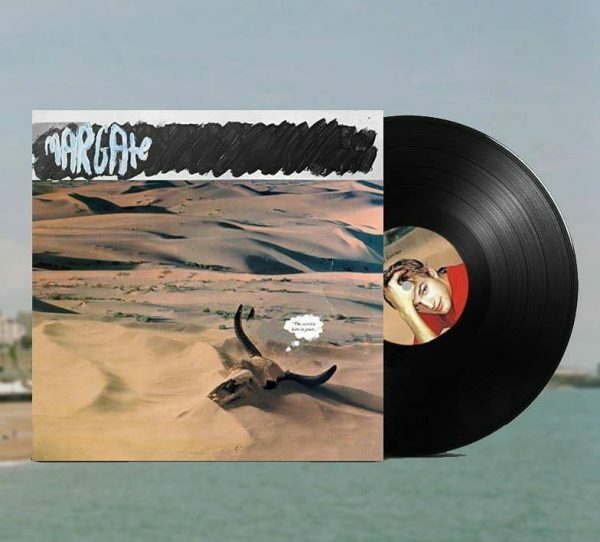 The cover for single ‘Margate’. 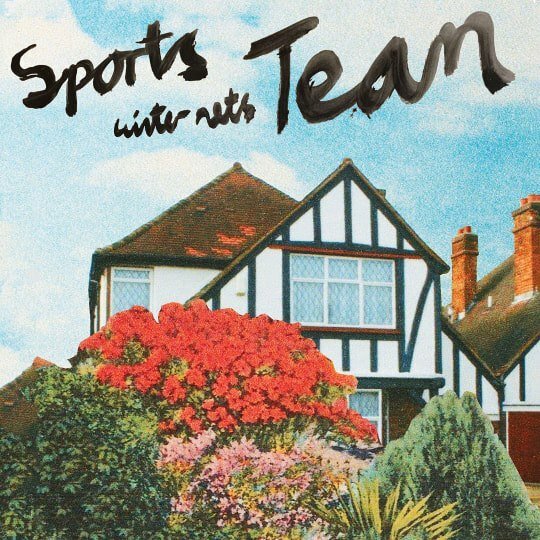 The cover of Sports Team’s ‘Winter Nets’ EP. So you played some new songs at Scala? Was that the first time you’d played them? Rob…yeah, that I’d like to play live but we can’t. Henry: It’s got a kind of 80s Miami Beach Vibe. Mack’s got a wonderful synth riff to look forward too. You’ve been recording in Wales? Rob: Yeah we’ve been recording in Wales! We were there for a week. Alex: We were working with Burke Reid again. He did all the Courtney Barnett stuff. He was over from Australia. Whenever he’s over, we always try and get hold of him for at least a week. It was really nice to learn what we could do in the studio, have a bit more time to play around with stuff like that. I don’t think we came very prepared though. We’re still learning to record, the whole process, we’re pretty new to it. I noticed at Scala that you were using a radio mic. You had an acoustic guitar. I thought, “something new is going to happen here!” Are you at the stage when you can start to experiment a little bit more? Henry: That was borne out of Wales, where we found this mic that worked very well for Ricey’s voice in that song. Then we tried to translate it to the live setting. Alex: It’s very Strokes-ey isn’t it? It’s a harmonica mic, technically. Rob: The key for us now is using Ben more [keyboards]. Ben’s always been on stage, doing his shaking. But he’s got his keyboard, and he’s very talented at writing. So, we’re trying to use him more in the new songs, work around him, and instead of guitar riffs, having some synth parts as a lead line. We’re going straight to our panned second album, going to the terrible inventive stage! I don’t think we want to move very far away from having two guitars, bass, vocals, though. Once we get into ‘sounds’, it starts to get washy, self-indulgent. So you, Rob, write all the songs? Have you always written songs? How long have you been writing? Rob: Since we started the band. The first one we did was ‘Stanton’. Took us about a year to write, I’d say. And we wrote a Christmas song… so pretty much from when we started the band. I play guitar anyway, and you’d have an idea, but actually sitting down and structuring something is so counter-intuitive. It’s painful and boring. Unless you’re going to record there’s no need to do it. You’ll have ideas but you’d never actually write a song. Alex: I think it’s our revival. I think we’re kicking it off. I’d say that all the people are part of our indie revival. Do you think Indie is really a useful term anymore to describe any kind of music? Al: It’s just a lazy term that just means nothing. Alex: It’s that horrible era isn’t it, that whole group of bands [in the noughties] that killed it. 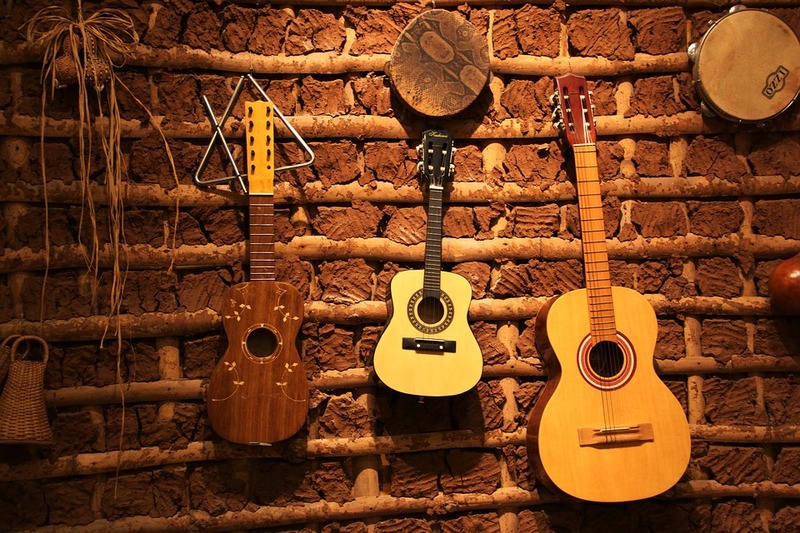 We always call it ‘guitar music’, but we haven’t found a word. We should coin something. The reason it’s hard to discuss I think is because it all sounds really different. What IDLES and Shame are doing is completely different to what we’re doing. The fact we play guitars is pretty much all we’ve got in common. Are there any other bands you’ve been playing with that you’re excited about. Who would you see as your contemporaries? Alex: There’s a lot of bands we like. 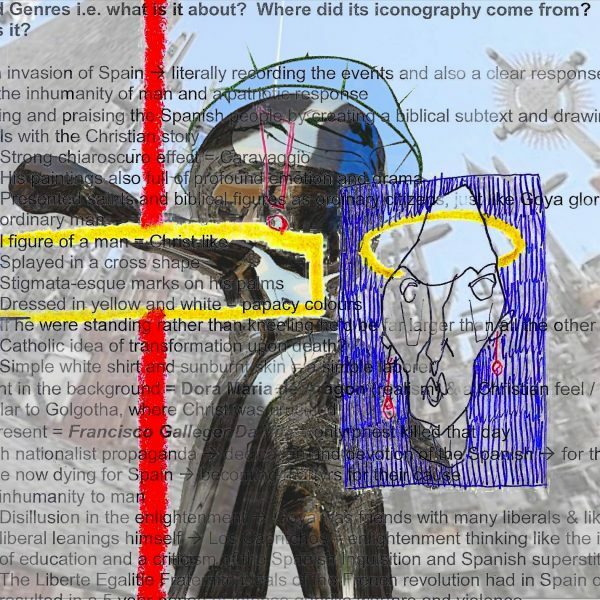 But I don’t think we see ourselves as having contemporaries. I genuinely don’t think we’re doing anything like any other band in the country at the moment. Would you say that’s down your brand of enthusiastic, positive music? Alex: I think it’s more than that. We always set it aside from a lot of these punk bands coming through. I regard us as more romantic, glamorising parts of England, trying to create a mythology around the places where we actually live. Looking good: working the big stage and being fashion icons. So, I want to talk about stage presence. There’s a very interesting dynamic where you have Ben, very cool, and you Alex, are more… flamboyant. Is that something that comes naturally? Rob: … and then Henry did his catchphrase…. Al: It’s getting a bit more joyful I would say. Do you enjoy playing on bigger stages? Rob… and he’ll put his hands behind him and do a ‘shush’ motion, telling us to back down. Al: I’ve been doing a lot of movement, y’know, roaming around the stage, getting out into the audience with my snare. “Silly stuff like capes and hats I’d quite like to get into”. Is there something you really enjoy about the small setting still? Alex: I don’t like them. I like big ones. More room. Henry: They’re good for playing intimate shows, where it’s seething, and the crowd are on top of you, but the bigger stages allow us to express ourselves. Also, no one can forget the fact that Vogue recently named you, Alex, one of 2018’s hottest boys. In all seriousness, it was just a question about fashion, what you wear as band, how you think about what you wear on stage and how you look. Is that important to you? Does it come naturally? Alex: We were talking about this today actually. It’s quite hard, because the stuff you’d wear out is very different to on stage, especially if you’re going to dance. A lot of flowy stuff, silly stuff like capes and hats I’d quite like to get into. Swim Deep look good but they don’t move so they could wear those big coats. There’s a band called UGLY we know that dress really well. But again, static, don’t move, so they can wear different kind of stuff on stage. Henry: Mac wears hiking gear! Alex: We’re finally getting to the stage where there’s the odd brand we can get some clothes off. Because we’ve always got all our clothes from charity shops. The suit I had for Scala, I bought that day for a fiver. A whole suit, really amazing. You realise, when someone puts you in new clothes for the first time, it’s so much better than the stuff you usually get. I’m hoping we can get a bit more of that. We did the shoot for Lazy Oafs, for example. The Orielles have done for them as well. They’re all kitted out in their clothes, but our stuff hasn’t quite arrived yet. Can I ask about your hats Al? How big’s your collection? Quitting the day job to be in a band and run a record label. A logo for Sports Team’s new label, Holm Front. 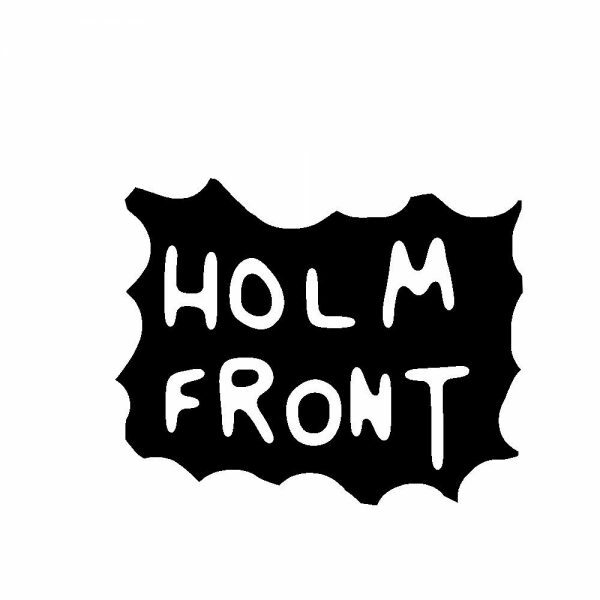 A second logo for the label Holm Front. You’ve also started a record label called Holm Front. Tell us about that. Alex: We just want to put out some interesting bands I think. Big money deals. Al: It mainly started so we could put out our own stuff, when we wanted, so that we could have complete autonomy. It’s interesting that you mention social media, because your presence on social media is quite distinct. The pictures of you, you’re always doing interesting things, you’re out in the countryside, you’re swimming, you’re smiling, you’re happy. A lot of bands look serious, but you look like you’re having a good time. Is this a conscious thing? Rob: Yeah, I force everyone to smile the whole time. Ricey hates smiling. Alex: Being in a band with your mates is the best thing in the world. It really is. 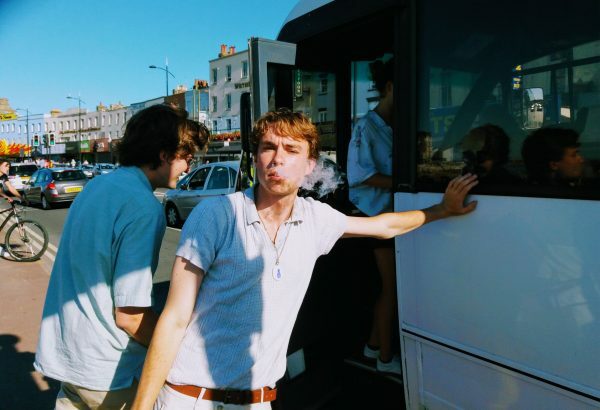 There are some bands which I don’t think enjoy it as much as us, who quite genuinely don’t really enjoy going on tour, find it a bit gritty, sitting in a bus, getting frustrated at each other. But we love it, every minute of it… I think we just try to do wholesome things as well. So you’re all full time musicians now? I read in Dork that you all quit your jobs in the summer. So what did you all do before you quit? Oli: I was working for a merchandise company. I was getting approvals to go into retailers from bands’ managements, so most of my time was spent on Justin Bieber T-shirts and things to do with that. Henry: I was a sports journalist for the Cable News Network (CNN). It went from being really big name interviews to sometimes really obscure stuff like, they sent me to Budapest to cover the Judo World Championship. So, I’ll come back and they’d be like “oh yeah, you’ve got to interview Pele”, it was very manic! Rob: I was a social media executive. I did two jobs actually. The first one was Noisey. The second was the Beano. A split world. Al: I worked for a tech company on social care. I spent most of the week up in Bradford, working for the local authority. It was nice contrast, sitting in residential care establishments for the week and coming back, kicking up with my mates, it was good! Alex: I was an anthropologist. We did a lot of ethnography, a lot of work in the U.S, where we would live with groups a few days. We did some work for social media companies. In Atlanta, Houston, Austin, Chicago. Just getting to know people, going to their homes, doing some work with them, making assessments. We were all doing our jobs at the same time [as being in Sports Team]. It got to the stage where we were all on our last days of leave that we had, we’d all missed days off work, taken so many afternoons off, that we just couldn’t do it anymore. It was more necessity than decision, when it came to the stage when we all quit. So, you’ve had a big year. Alex: Well, we’ve only been around a year! We only put music out in January, so it’s been the only year we’ve had, but it feels like we’re kicking on now. But I suppose you’re always slightly torn in the sense that very easy to pat yourselves on the back at this stage and say “oh it’s going amazing it’s going really well”, but actually it’s the first time you’re getting attention doing what you’re doing. So nothing that’s annoying you? Sports Team play The Bullingdon on Monday 19th November, supporting Hinds. If you can’t make it they’ll probably be in Oxford again very soon – keep an eye out!